Departure II LS Shirt- Mens is rated 4.9 out of 5 by 12. Rated 5 out of 5 by Runningbandit from Jack of all trades This shirt seems to do it all. I can wear it while doing light activities or can wear out at a nice restaurant. (I have the all black one) The fit and style is perfect for me. I have an athletic build so it feels like it was custom made for me. And the comfort level is beyond anything I have worn. Will definitely get more shirts like these in the future. 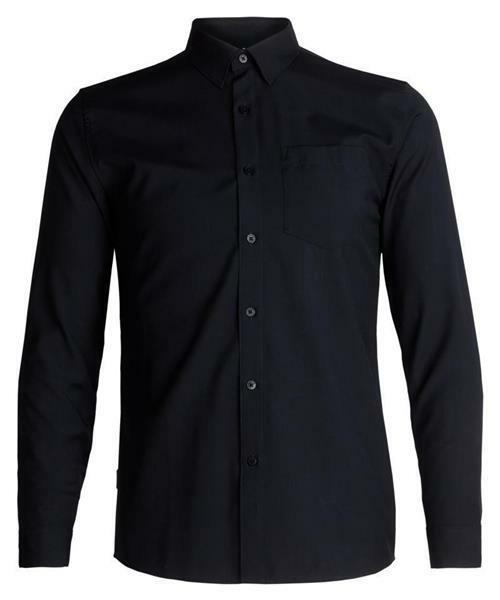 Rated 5 out of 5 by Likadamerino from Great everyday shirt The Departure is a fantastic shirt for everyday use and can be dressed up or down depending on the situation. I have a few different colors now and they hold up very well to regular use, no fading or loss of shape. Very high quality and very comfortable. Rated 5 out of 5 by Coldstream from Good looking and versatile This shirt is very comfortable and good looking. It is nice enough to wear at a casual function and versatile enough to wear under a couple of layers while hiking in the mountains. Got lots of compliments. Rated 5 out of 5 by AStovold from Great for travel or the office This shirt is great. It fits as advertised and travels very well. Easy to wash and dry on the go and nice enough to wear into the office or out at night. Rated 5 out of 5 by GaryAB from Comfy & Cozy Nice soft finish to shirt perfect for wintertime! A 'silkier' finish than other LS shirts. Hope they add more colours! Rated 5 out of 5 by Paiwhistler from Perfect for dressing up in the cold Nice fit and comfort. The dressy look is perfect for special occasions like Christmas Dinner or a night out.